After a number of posts on local travels which include a visit to historical Melaka and a weekend trip to Belum Rainforest, I'm now back with my Bangkok posts! During my trip to Bangkok last February, my friend and I visited Bang Rak. This is the area near to Saphan Taksin BTS Station. There seems to be a lot of good eateries between Taksin BTS Station and the junction of Charoen Krung and Silom Road. However, we did not have time to visit all the places. I had wanted to eat lunch at Black Canyon Coffee inside Robinson Bang Rak, but it was full! So we walked to this shop called Volcanic Fried Mussel and Oyster (or Thip Hoi Thot Phu-khao Fai in Thai). Funny name for a restaurant, but there's a story behind it. Located just opposite Robinson Bang Rak at Soi Charoen Krung 50, this restaurant is famous for its well, volcanic fried mussel and oyster! Haha! From what I heard, the shop was originally a humble outdoor stall. The owner had used a diesel stove to cook, performing stunts that made the flame flared up high, thus attracting attention of tourists. That was how it got its name 'Volcanic Fried Mussels'. Later, the owner moved into this shoplot and used a gas stove instead, so there were no more fire stunts to watch. 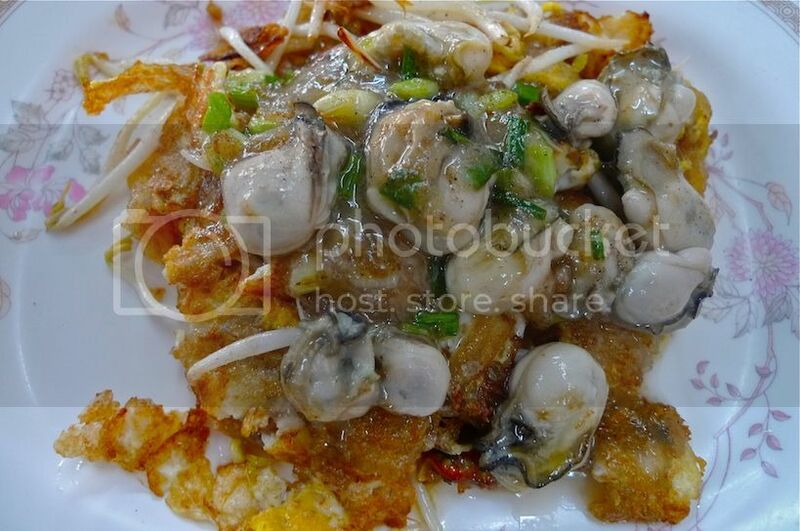 However, the shop's famous fried mussel and oyster pancake continues to draw locals and tourists alike. Both my friend and I ordered a plate of their signature dish each. It was really very delicious!! Generous loads of pan-fried fresh mussels and oysters were served on top a bed of bean sprouts and eggs, accompanied by a bowl of sweet and sour chili sauce. The texture was crispy and gooey at the same time - perfect! Priced at 70 baht (RM 7), I thought it was totally worth my money, considering the large portion. If you ever visit Bang Rak, do not miss this yummy Volcanic Fried Mussels and Oysters! Directions : From Saphan Taksin BTS Station, head north along the Charoen Krung Road towards Robinson Bang Rak. Turn left before Robinson Bang Rak into Soi Charoen Krung 50. The shop is somewhere on your left. 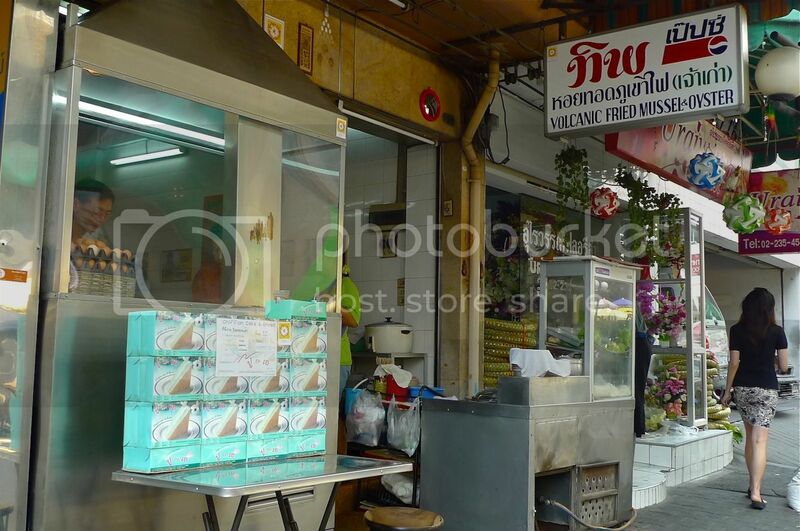 After our lunch, my friend and I walked along Charoen Krung Road to look for desserts. 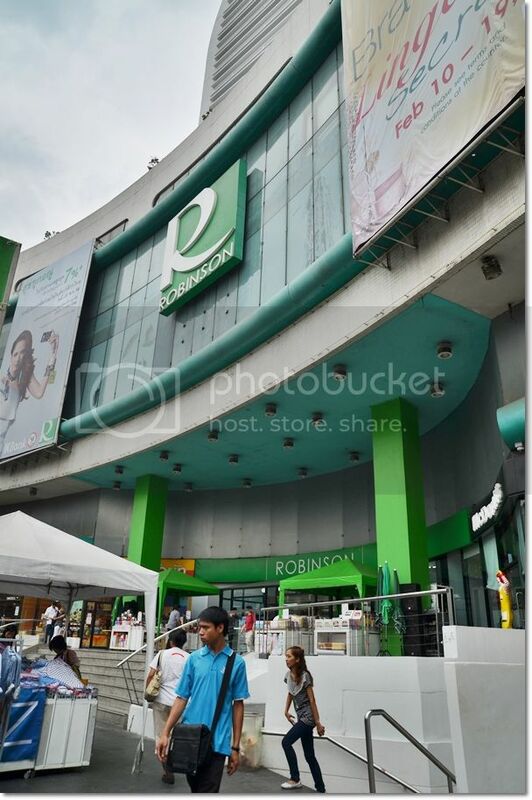 We walked past Robinson Bang Rak and then saw a shop called Boonsap Thai Desserts. Boonsap Thai Desserts sells a wide variety of sweet stuffs and I was told that it is a famous dessert shop in Bang Rak, and possibly the whole of Bangkok. 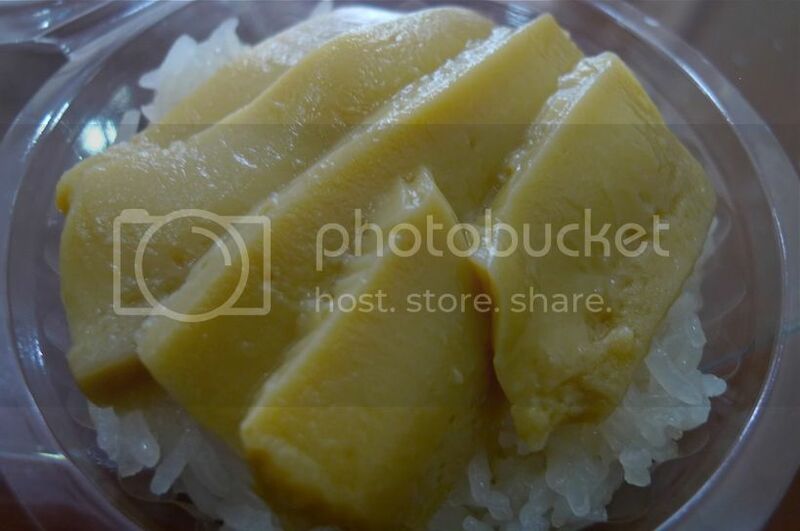 My friend tried their sticky rice with mango, but I zoomed in on their very unique sticky rice with creamy steamed egg custard (sangkhaya). Priced at 25 baht (RM2.50), it was delicious! The egg custard was very smooth and creamy and matched perfectly with the sticky rice. Yummy!! Of course, this still cannot beat my top favourite sticky rice with durian, which was not available at Boonsap. But I am definitely biased because I love durians way too much! LOL!